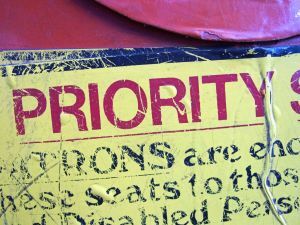 You can rank your priorities until you’re blue in the face, but until you act on them, it’s just a wish list. How many posts have you read about writers and the use of social media? Zillions, I bet. Branding, marketing, building a reader base, connecting with the reader, dividing your time between writing and social media. This is just a simple reminder to myself that sometimes social media is (and should be) dead last on my list. For the past several weeks, my writing time has been eaten up by social media. It’s my own fault, really, because when I sit down at the computer to write, instead I find myself on GoogleReader checking out all the blogs I love, or eating up Twitter, or wasting precious minutes on Facebook. I have to become better at this. It would help if all you bloggers would stop writing things that are so wonderful. Seriously. Stop it. I love blogging. In fact, I had a great post planned for today. But life got in the way, and truth be told, I’m tired. So tired that that post is going to have to wait. That’s how it falls in my universe. Priorities. I have to stop talking about what they should be and make them what they are. As I began typing this post, my oldest son got out of bed and came to find me. He’s supposed to be asleep. This is something I do for him on a pretty regular basis. I’ve been singing to him at bedtime since he was born. And I went and sang my son some songs. Share with me: What priorities have you been talking about but not acting on? I’ve been doing a lot of refocusing and reevaluating of my priorities lately. Seems they can shift so subtely, without notice. My house needs some TLC, maybe I’ll cave and do that. TLC on the house–yep, if I don’t get to that soon, my family might refuse to live here. Beautiful. Such a great reminder. Sometimes we have to stop talking and start acting. Myself included! Exactly. I keep saying what my priorities are, but I don’t think I’m living it. Not lately, anyway. I’ve been talking about needing to spend more time with my husband, going on dates, talking, walking the dog together, etc. Last night, I had planned to get some revisions done for my WIP. But we went on an impromptu date, and then we took the dog for a walk. And I don’t regret it for a minute. Hear, hear! Timely post, it seems – obviously you’re listening to God for ALL of us! 🙂 I’m just talking stock of my own. Thanks for the comment! If Child Protective Services walked into my house right now, well, the kids would be living somewhere safe and non-toxic. But in my own defense, I have a fairly severe back injury that has blessed me with the inability to bend over much. And that is why I don’t fold the laundry. Priorities?You mean for real, right? Priorities? Battling with myself right now over what really matters… time away from my family is killing me right now and my passion in my career is with kids. I have to find my way back there SOON in order to save my sanity. GOOD FOR YOU!!! there are so many nights when i don’t want to engage in the bedtime routine of reading and then snuggle time when the lights are off. it takes at least 20 minutes, and i think of all the things i could be doing instead. then i look at my daughter’s sweet face, pleading for me to read the some Bible (come on! the BIBLE, for goodness sake)…and i know if i don’t, i’ll regret it and feel guilty. i won’t have these precious moments for very long. in fact, i just voice-recorded her saying that she’ll “always want to snuggle with her mommy,” for so that i can give her proof when she pushes her aging mother out of her teenage door covered with pop stars and heartthrobs that at one time, she thought the relationship we have now would last forever. sigh. i’m getting nostalgic already, and it hasn’t even happened. great post, and very real. i’m giving you jazz hands, girl. major jazz hands.